Getting to Ouzoud from our Airbnb in Marrakech was a fairly long drive (about 2.5 hours, if memory serves). Remy mostly read on his Kindle Fire while the rest of us chatted with the driver/ each other and listened to the (Arabic/ Latin) pop music the driver picked. And I, of course, took many photos of the landscape as we whizzed by. We drove past lots of little villages and one bigger town, Zemrane Charqia which is an (olive?) oil producing commune. It was market day and we passed at least two carnivals setting up, one in Marrakech and one in Zemrane. Zemrane also had some neat murals along the road. Which are really hard to get good photos of from a moving car, but I did my best. The waterfalls of Ouzoud are in the High Atlas mountain range, which once again, felt very familiar to this Northern Californian. And then we were there, in Ouzoud. We hired a guide to take us down to the bottom of the waterfalls. We started on one side, looking down, then walked over the back to the other side (there are bridges over the streams), then hiked down on that far side. Remy got a little freaked out by view looking down at the falls, but we took a roundabout way down and he was ok, once we weren't on the brink. He had a great time once we got to the bottom, where we went swimming. There were many more (mostly young, European) tourists than I was expecting, given how few tourists we had been seeing in the rest of Morocco. These tourists were mostly on bus tours, it seemed like. Since the falls are a major tourist destination, there were many restaurants, souvenir stands and even ladies doing henna. I did end up buying another hamsah (a necklace this time) but I refrained from getting any henna, even though the ladies seemed really nice and I don't think it was so-called black henna (never get a black henna tattoo!). Anyway, after swimming and picture taking (we got the ubiquitous family photo of us standing on that rock in front of the falls), and eating the lunch we'd brought with us and tourist-watching (and watching the local boys climb the rocks and dive into the water) it was time to go - we started back up to the top of the waterfalls. This time we took the stairs/ ramps on the near side. Yeah, it was a long climb, but I made it! There were many more restaurants and souvenir shops on this side of the falls. 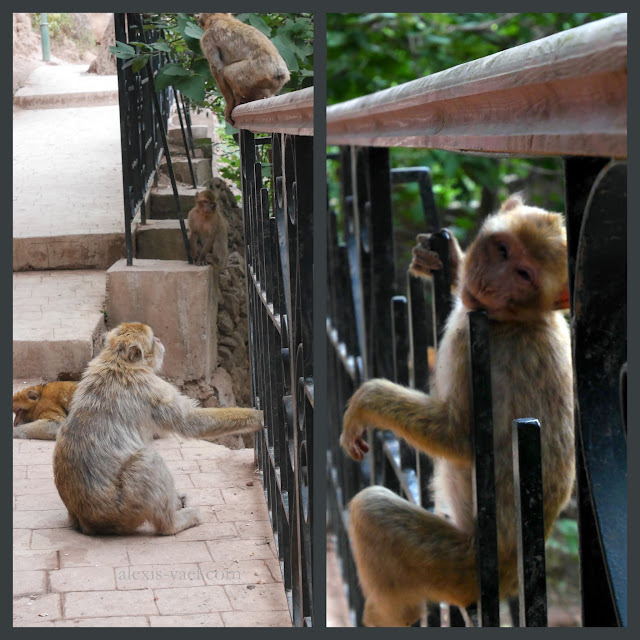 And this was the side with the infamous Barbary macaque monkeys, who are often enticed to sit on tourist shoulders with nuts, given by an enterprising local. We didn't have any interest in the monkeys being made to sit on us, but we had been told to bring nuts with us (to give to the locals) and so we did get to watch the monkeys interact with each other (and us a little) for awhile. I'm not sure what part of having a wild monkey eating on your bare shoulders seems like a good idea. I was kinda waiting for it to pee (or worse) on someone. Ewww. We walked away from this group. At the beginning, a few of the younger monkeys were allowed to take nuts from us. Then the older ones came over and we stopped feeding them. One thing I did not know, but learned on wikipedia: Barbary macaques are alloparental, which means that the males take an equal role in caring for the young. This makes some of the interactions we saw a little less confusing - one of the larger macaques that was carrying an infant rushed at and drove off another large macaques which had been sneaking up behind me - this was super strange to me, but it turns out that the males that are higher up in the group hierarchy often tease and fight off lower ranked males with babies in arms. After that last monkey fight, we made our way to the top of the waterfall and back to the car waiting for us. The drive back seemed to pass faster (as usually happens) and we arrived back in Marrakech right around iftar. All in all, it was a very fun adventure.